I have really enjoyed the photos from Nath's PhotoBlog so I thought I would put a few of mine up. I only have a Nikon Coolpix camera but really enjoy trying to take good photos! This one was taken in Side in Turkey on my family holiday there last summer, the sun set over the sea and was one of the most beautiful things I've ever seen. 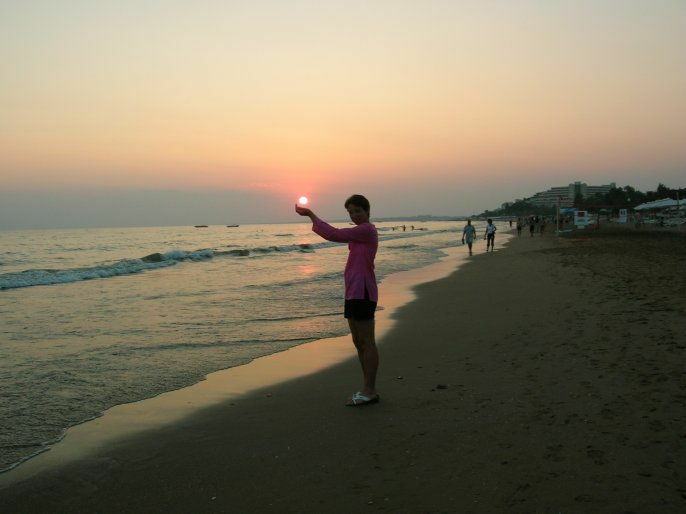 This photo is of my mum trying to hold the sun in her hands! Any comments on how to make it better would be appreciated, I don't know much about photography!! And how can I make it appear on here as I see it on my screen? – seems to be a bit pixellated on here!